Walking into a sold out Madison Square Garden last night, you could feel the excitement in the air with what was about to come. Everywhere you looked, it was a sea of black clothing: chiffon, top hats, and boots; all emulating the style of the night’s performer, the one and only Stevie Nicks. The night’s special guest, Chrissie Hynde and the Pretenders were a force right from jump, kick starting into “Alone” from their latest album of the same name. Hynde was in great voice, singing old songs and new with a raucous enthusiasm that had the audience standing on their feet. An exception to this, a beautiful acoustic arrangement of “Hymn to Her”, was especially poignant because of the dedication to Stevie. This was immediately followed by “Back on the Chain Gang” and “I’ll Stand By You”, the latter’s message being an especially resonant message for this country, when people are feeling increasingly uncertain about the nation’s future. This was followed immediately by another song that speaks to today’s headlines, “Holy Commotion”, which is about cutting all facetiousness out of religion, and taking in its true themes: love, peace, and happiness”. The Pretenders’ set closed with “Brass in Pocket”, ending with a fierce sense of self-confidence that Chrissie Hynde displays so well. Overall, their set was very enjoyable, proving to be the perfect double bill of strong, badass rock ladies. About half an hour later, in came Stevie Nicks, and the crowd went wild. After opening with 1981 “Bella Donna” outtake, “Gold and Braid” she announced to the audience that this was not going to be “the usual Stevie Nicks show” and she made good on that promise. The third song in her set, “Stop Dragging My Heart Around”, featured a reappearance of Chrissie Hynde, taking Tom Petty’s place in the duet. It was awesome seeing these two onstage together. There was a very easy camaraderie between the two women and you could get a sense of the mutual appreciation society happening up there. Throughout the night, Nicks featured songs from her 2014 album “24 Karat Gold: Songs from the Vault”, lesser known album cuts, and songs she had rarely, if ever, performed live before. The most stunning of these, and perhaps the best song in the set list was “Moonlight”. The song, that was originally on her 2011 album “In Your Dreams”, was performed in a stripped down arrangement that made the song’s emotionality all the more potent. Nicks’ lyrics, partly inspired by the “Twilight” series, could be fully felt as she gave a beautiful, inspired performance of the song. Nicks also performed a medley of the songs “Bella Donna” and “Wild Heart”, from her first two solo albums of the same name. This was followed by one of her many stories from the night, which were very charming, endearing, and very much like hearing from your mom. The anecdotes ranged from writing songs in Tom Petty’s basement, to a sweet shout out to the kids from “School of Rock the Musical”, and of course, encouraging the audience to follow their dreams. 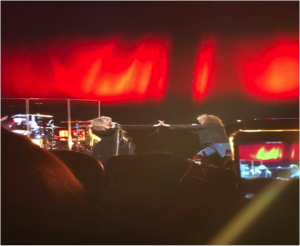 One of the best surprises of the night was when Nicks performed “Crying in the Night” from the Buckingham Nicks album, which was released in 1973, but hasn’t been formally released since then, as the duo, Nicks, and Lindsey Buckingham, were dropped shortly after its release. The song, which was written when she was 22 years old, had never been performed onstage before. 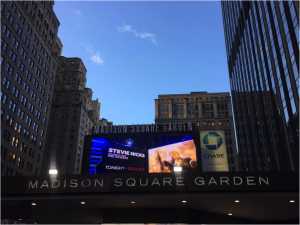 Performing in Madison Square Garden, 43 years later, is a testament to how dreams come true. Madison Square Garden is of course home to the New York Knicks. 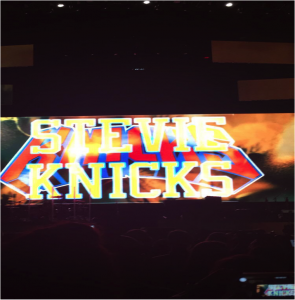 The opportunity for a pun was not lost then, when the screen displayed a playful play on Stevie’s last name. The audience went nuts. The set list of course featured all the hits of Nicks’ career, from both her solo and Fleetwood Mac careers. “Stand Back” which featured a moving tribute to Prince, a version of Gypsy that displayed beautiful harmonies from Nick’s two backup singers, Marilyn “Minnie” Martin and Sharon Celani. “Gold Dust Woman” was a rollicking force made all the more trippy by Nicks’ self-proclaimed “crack head” dance. “Edge of Seventeen” and “Rhiannon” were performed at the end of the show to great applause. Nicks closed the show with “Landslide”, a song she has performed numerous times on countless stages. And yet, the song seems to be her seminal classic. The entire arena was singing along, it was that moment in a concert when 18,000 people are unified by one message. It was beautiful.